Several years ago, a friend with relatives in the South shared with us the bounty they had sent – a huge bag of pecans! 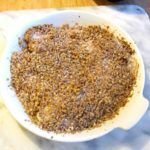 We put pecans in cereal, I put them in apple crisp, and I experimented with them. One day I ground some up and used them as the breading for baked pork chops – and they were delicious. 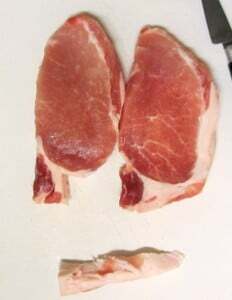 First, I took 2 boneless loin chops. 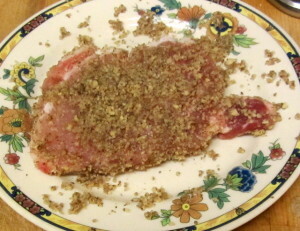 (I mean, you *can* use bone-in chops, but I think they’re a bit of a nuisance, breaded…) I trimmed off most of the thick fat along the side (though I left that little tag of meat at the edge.) These were each about 4 ounces, which is about right for us. I put 1/4 of pecans in the mini-processor that came with my immersion blender. I find it very useful for small amounts of things like this. A regular blender would grind them to a paste, so if you don’t have a food processor, I’d use a knife… (They’re soft and chop pretty easily – I have done that in the past – it’s only a minor nuisance to do enough for the recipe.) I just whirred them with a couple of separate pulses, until they were about the texture of bread crumbs – you can see it in the picture. I put the chopped pecans on a plate – if I were scaling the recipe up, I’d want at least a larger plate, though a wide bowl might work better. I added a few shakes of salt, and a few grinds with the pepper mill. I’m not trying to be vague, here – but 1/4 teaspoon of salt, or even a generous pinch, would really be too much, I just used a regular salt shaker. 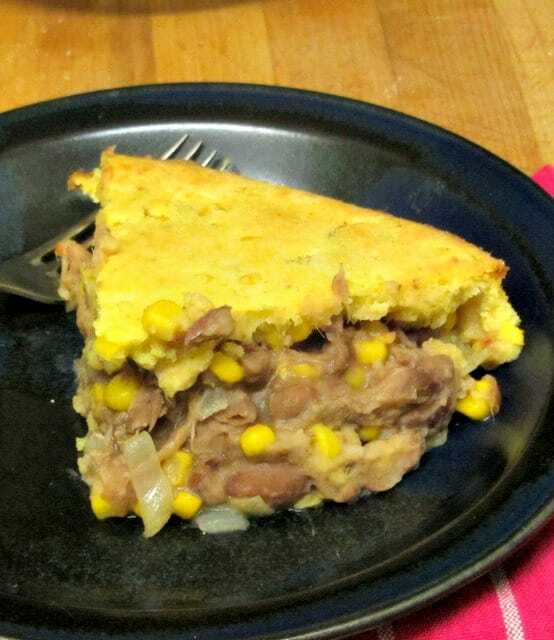 And fresh ground pepper is the only kind worth using, as far as I’m concerned… I usually add it at the table, but here, it is good actually in the crust. 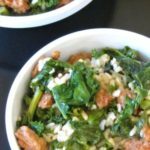 You could add a little other seasoning, too – a pinch of sage or thyme, perhaps – but the pecans themselves have enough flavor that nothing else is really needed. I put the chop – just as is, not moistened or coated or anything – right on the nuts, and pressed down lightly, then turned. The nuts did clump a little, so I broke up some of the clumps that were sticking to it and gently brushed them over to the parts that weren’t covered, then patted them on. I turned the chop over again a time or two, until it was thoroughly but thinly coated, then repeated the process with the other chop. I then put the coated chops on a rack on a baking pan. (The rack keeps them from sitting in any fat that cooks off them, and helps the coating stay stuck to the meat. It will work without one, but possibly not quite as well.) As long as I had the oven on, I also baked a squash… so you see it on the rack, too. I baked them at 350° for 40 minutes – check for doneness at 35 minutes. It was delicious. The chops were moist and tender, the crust was crisp and flavorful. 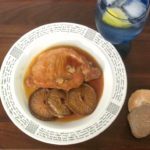 Most of the time I think the best way to adapt for a food restriction is to find a recipe that simply doesn’t require that food. It can’t always be done… but when it can, I think the results are usually better than a long list of substitutions. 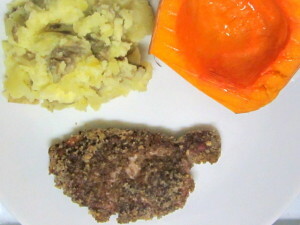 This is a case in which the adaptation was something I’d done earlier to improve the recipe – we certainly didn’t miss bread crumbs. 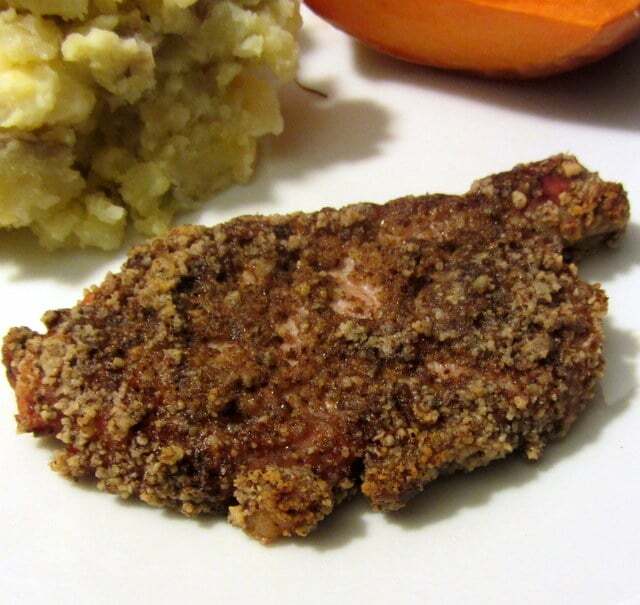 So, here I have a gluten free baked pork chop – crisp and crunchy, with great flavor, and hardly second best. 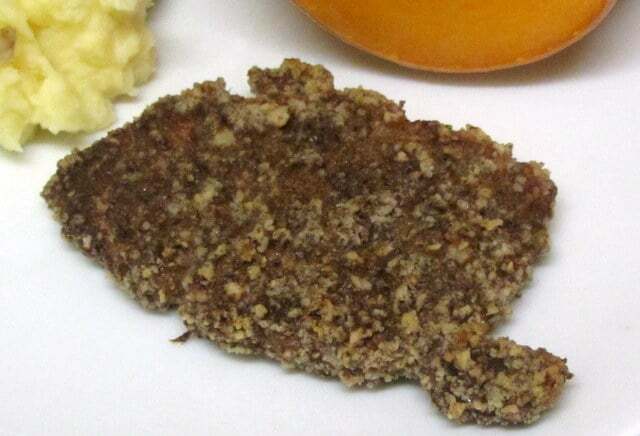 Gluten Free baked pork chops with a crisp pecan crust, tender and delicious, with minimal fuss. 1/4 c pecans for every two chops. Trim chops, removing the thick fat around the edge. 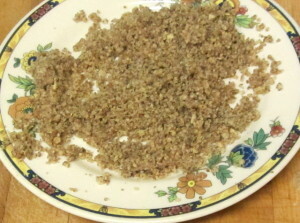 Use a mini-chop or food processor to chop pecans until they resemble bread crumbs. Several pulses usually works best. Place chopped pecans on a plate, stir in salt and pepper. Dip chops in the pecans, coating each side. Place chops (on a rack, if possible) in a baking pan. Bake for 35-40 minutes, until done. Thanks! I think the part I liked best (after the flavor, which was wonderful) was that it was so easy... I didn't need to play games with flour and beaten egg, the chopped nuts just stick on themselves!